We've been adopted by an amazing human! Hooray! 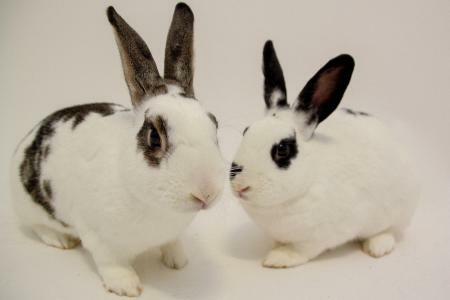 Two of the loveliest rabbits you’ll meet are waiting for their forever home! Anise (black and white) and Rocky Raccoon (Pepper and White) are a pair of bonded siblings. They love grooming each other and spend most of the day munching on hay and snuggling. They are a low maintenance pair who enjoy lots of pets and spending time with their guardians. Anise is a gentle soul. She loves snacking on timothy hay treats and taking naps during the day! She also shyly hops over to you if she wants some cuddle time. Rocky Raccoon is very sweet. He has spurts of energy and runs around the room doing binkies. He really enjoys scratches behind the ears when he’s settling in for a mid afternoon nap.